Vice President Ma. Leonor “Leni” Robredo stands firm by her position to regulate social media to counter the spread of fake news and other false information online. Robredo, who has been a victim of fake news, reiterated the need for Congress to pass a law regulating social media, especially if these involved “deliberate, organized, and large-scale dissemination” of fake news. “This is the direction that we must take. Individual freedom of expression must always be protected. But the deliberate, organized, and large-scale distribution of fake news on social media needs to be addressed through legislation,” she said. “It is a demand that has likewise been articulated to the various social media companies, such as Facebook, YouTube, and Twitter, who have, in fact, taken some initial steps to clamp down on fake news on their respective platforms,” she said. The Vice President made the statement in view of her suggestion to lawmakers on Wednesday to craft a law that would regulate the use of social media during an interview in Dagupan City. 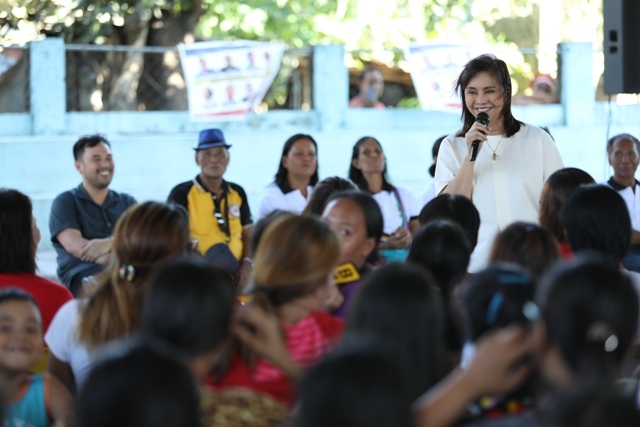 Robredo said the Congress needs to pass a law that would “control and regulate posts on social media” in the context that it is “being abused in a very negative way” during elections. “The campaign has been dirty. It has become dirtier because of social media,” Robredo, chairperson of the opposition Liberal Party, said. This is despite her proposed regulation on social media would violate Filipinos’ right to free speech. “Let me be very clear, I firmly stand by the Constitutionally guaranteed human right to free expression and do not support any broad, generalized restriction on this right, whether it is exercised directly, or through traditional and social media,” she said. “But I also strongly believe that the deliberate, organized, and large-scale dissemination of false information, ‘fake news’ in our current parlance, must be distinguished from the individual right to expression,” she stressed.